FINALLY! Someone has created a health & wellness program that includes realistic, attainable exercises for seniors and baby boomers! If you’ve been told that as you age, you slow down naturally and there is no reason to exercise, you’ve been lied to! Read more here. This program is designed for normal people over the age of 50, with no need to have a background in any physical athleticism. Exercises and workout routines designed SPECIFICALLY for men and women, over 50 years. Beginners welcome! Each exercise routine includes modifications and several different levels to accommodate physical limitations and allow you to “level up” as you progress. All exercises and routines in this program can be done at home or on the go! All of the exercise routines in this program use your own body resistance and can be completed wherever you are comfortable — no gym or special equipment required! This program will give you the muscle strength and the confidence it takes to face aging head-on, confidently. 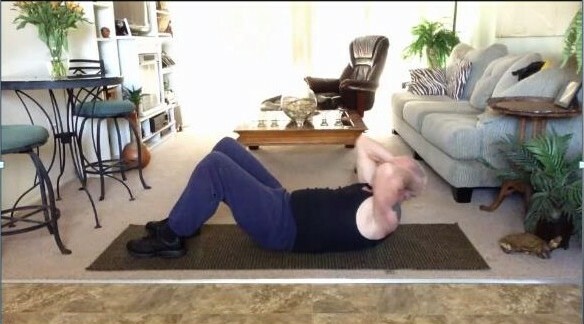 We will teach you how to use the exercise techniques practically, such as to get up after falls. Some muscle-bound Greek God demonstrating workout routines that make you feel inadequate. High impact, high energy aerobics, and calisthenics, designed to achieve unrealistic results in an inordinate amount of time. Yoga or Pilates regimens that would make a contortionist wince. A gym membership, with access to a building full of “high tech” exercise machinery. A high priced personal trainer that has no concept of senior citizens and aging baby-boomers. A 79-year aged compassionate fitness/wellness personal trainer/ coach at your side for 90 days. Someone who will personally demonstrate what you are capable of if you follow his time-proven methods. Your answers will give me the necessary tools to adapt my 90 day program to fit your situation so you can reap the best, long lasting benefits you can enjoy for the balance of your lifetime.